This is a boring old weight-loss post. I apologise for this but Woolgathering is my diary and these notes are for my benefit. There is no requirement to read so, please, just pass along quietly unless you really want to suffer/celebrate with me. My tale begins back on Sanday, which was where I last knew my weight before we settled down here. It pains me to reveal this to the world but I weighed 105 kilos then. Living full time in a motorhome is not conducive to exercise. Nor are sore Achilles tendons. There was a period when I moved around very little, with inevitable weight gain: my Fat Lady clothes (UK 22) began to strain across my ample chest. Matters only worsened last winter, when we suffered some appalling weather both in the UK and in France. I don’t know where the scales topped out but I have been using a guess of 113 kilos. Fast Forward to a new life in the Crooked House, with daily dog walks and loads of fair weather, when we lived upon salads because it was too hot to cook. The weight loss was obvious. Things began to fit. Slow and steady weight loss followed, from a sensible regime of eating a little less and exercising a little more. I upped my daily step goal from 8,000 to 10,000 but often we put in more than that. When we were in Spain over the winter, Mr L suggested that once we arrived home, we might try the Keto diet. His interest was in healthy eating though he was not averse to shedding some weight either and he had read that this diet was good for getting you past a plateau. He had stopped losing weight and was frustrated by that. I wasn’t entirely comfortable with tackling a “crank” diet but agreed to do it. 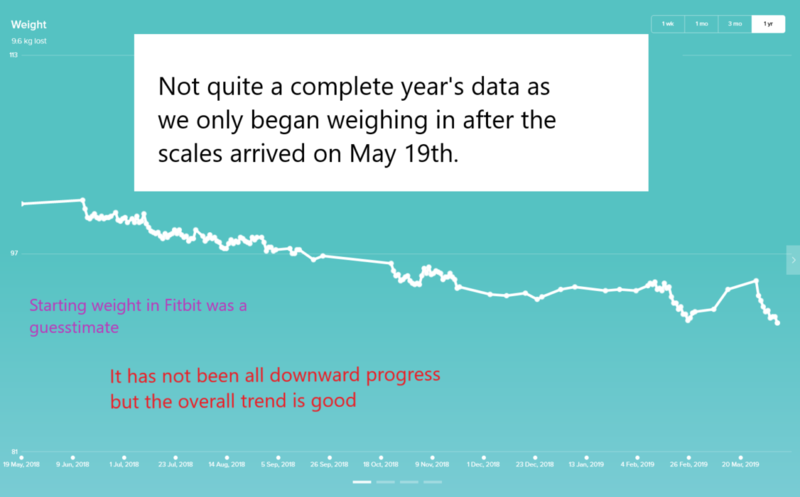 We started Keto around the 18th February (looking at my weight loss data) and the results were immediately impressive. I shed 2.2 kilos in that week alone! What I hadn’t expected from this diet were the additional health benefits. I was astounded to find that both my IBS and gastric reflux issues just vanished. Immediately. It’s an easy diet to stick to. I never feel hungry and don’t feel deprived of anything. I get no real cravings. I weighed in at 94.2 the day before starting Keto. We didn’t get long at it, due to Life intervening but after 13 days, I weighed in at 92.3. 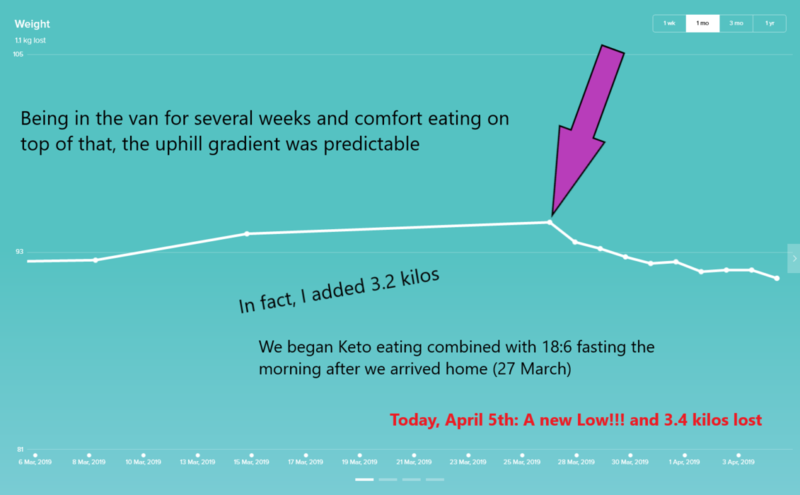 A family crisis and a dash back to the UK to live in the van in wintry conditions again… plus comfort eating, saw me add considerable weight back on last month, Once we were home again we got back to eating Keto. I was keen to lose the additional weight quickly so we have been combining Keto with 18:6 fasting. I am happy to report that my excess baggage is fully lost and today I weighed in with a new low. I can now carry on with my overall weight loss. Since June I have lost 9.6 kilos and overall it must be more like 20, maybe more. I seem to have dropped two dress sizes and ,my leggings have become positively baggy. Whilst we were in the UK I was delighted to waltz into a shop and grab something to wear straight from the rail. It fitted comfortably. YAY! With winter over and better weather (supposedly, this week seems to have taken a downturn) we plan more exercise. It is time for me to up my daily step goal. My plan was to combine Keto with fasting only until such time as the excess went. In practice we have found it quite easy to do and are happy with the results so perhaps we shall keep it up for a little longer. Weight loss or no, I plan to adhere to a low-carb diet for the foreseeable future as the improvements to my general health and wellbeing have been positively startling. Once we have lost all of the weight that we would like to, we will most likely increase our carb count a little but I don’t plan to return to eating refined grains or sugars. I would desperately like some fruit occasionally, though!